Phillip Hughes was an uncomplicated country boy, who moved as a youngster to play cricket against the men from the city. The son of a banana farmer, an upbringing in the coastal town of Macksville involved honing his raw talent on a pitch that had more room on the off side than the leg. Because of that, he developed a rapier thrust of strokes through the off side that remained throughout his career. Hughes joined Western Suburbs, the Sydney club of current Australia Test captain Michael Clarke, and cut such a swathe early on that he was called into the New South Wales team for his first-class debut just before his 19th birthday, making 51 in his maiden innings at that level. That early success gave an insight into the self-belief Hughes possessed, or was perhaps simply a result of the fact that he had come to town to do what he loved: play cricket. He was uncomplicated, a natural, phlegmatic, laconic, affable and easily engaged. Very early on in his time in Sydney, I asked him to get involved in a charity day with a lot of kids and he didn't hesitate. It was that simplicity to his character that made Hughes liked by an enormous amount of people. He was easy-going, a lovely, team man. He did not appear to possess any jealousy or envy, which can be common in professional sport. He held no grudges when he would later be left out of the Australia side, by selectors who perhaps could have shown more tolerance to a few of his errors. His international career, which began little more than a year after that first-class debut at the age of 20, was spasmodically brilliant. The twin hundreds he made in only his second Test made him the youngest batsman to ever achieve that feat, but chinks in his armour were found and he was left out of the side six months later, during the 2009 Ashes in England. Hughes would never again fully own a spot in the Test team, with his last match, in the 2013 Ashes, coming only one game after he shared what was then a record last-wicket partnership of 163 with Ashton Agar. Along the way, he became the first Australia batsman to score a century on his one-day international debut, against Sri Lanka in Melbourne in 2013. But, again, a place in the limited-overs side was never guaranteed. However, it was at the time of his death that Hughes was just returning to the top of his game. With Clarke set to miss the first Test against South Africa, his 63 not out for South Australia against his old New South Wales team was putting him in line for a recall. Things were looking good when, a few days before his 26th birthday, he missed a hook shot and was hit on a part of the head that was just too vulnerable. 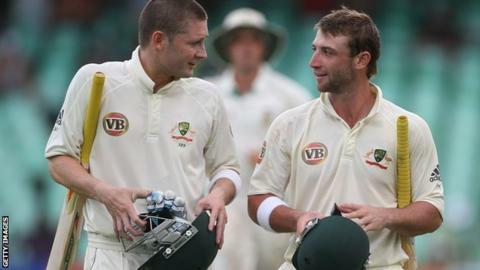 As he was carried from the pitch, Hughes was flanked by David Warner, Shane Watson and Brad Haddin, three men who had been part of his cricketing development, team-mates with New South Wales and Australia and, above all, friends. Though they were opponents that day, they were brothers in arms. While Hughes was tended to and operated on in Sydney that evening, players from both sides stared into the night, inconsolable. Before he died, there was a feeling that Hughes was on the verge of not only re-appearing for Australia but doing it in a big way. Now, there is just huge loss and a sense that such a prodigious talent has been prevented from fulfilling his enormous potential at the highest level. A young man with so much to offer has been taken in his prime.